Build a scalable system to collect data (including text messages and media like images, videos and audio) from WhatsApp utilizing both crowdsourced suspicious message reports from users and monitoring public groups. To clean, study and analyze the collected data to mine features. To get the data annotated for 'fake or not' and finally train and test a Machine Learning model on it. We plan to implement our ML model into an application users can download into their phones, which would provide them with nudges on the messages they receive in their WhatsApp application, indicating the veracity of the message along with the confidence. 31 July, 2018: Bengali News18: হোয়াটসঅ্যাপে আসা খবর কী সত্যি না ফেক ? জানিয়ে দেবে এই অ্যাপ. 30 July, 2018: Business Today: Soon we'll have an app to highlight fake news on WhatsApp. 30 July, 2018: Punjab Kesari: WhatsApp पर अब रंग बताएंगे मैसेज असली है या नकली!. 30 July, 2018: Navbharat Times: WhatsApp: रंग बताएंगे, मेसेज असली है या फेक!. 30 July, 2018: Live Mint: How a Delhi-based professor is fixing WhatsApp’s fake news problem with machine learning. 29 July, 2018: Tamil Samayam: Experts working on app to flag fake news on WhatsApp. 29 July, 2018: The Economic Times: Experts working on app to flag 'fake news' on WhatsApp. 29 July, 2018: The Times of India: Experts working on app to flag 'fake news' on WhatsApp. 29 July, 2018: India Today: Experts working on app to flag 'fake news' on WhatsApp. 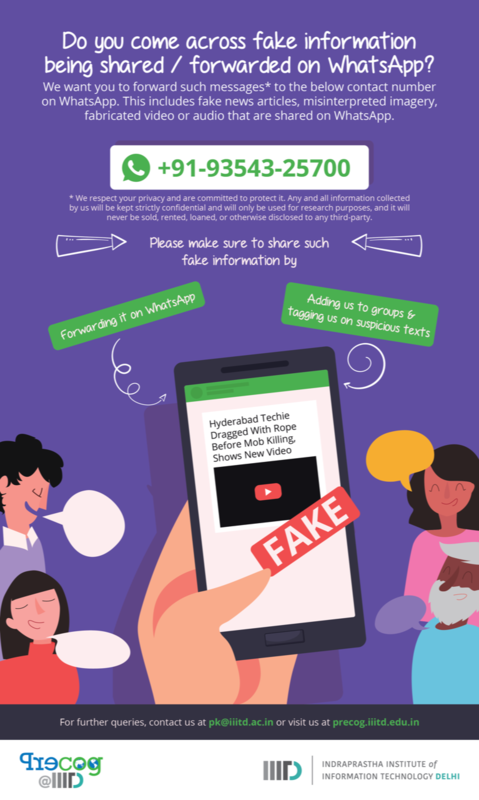 29 July, 2018: Outlook India: Experts working on app to flag 'fake news' on WhatsApp. 29 July, 2018: Rising Kashmir: Experts working on app to flag 'fake news' on WhatsApp. 29 July, 2018: Aaj Tak: Whatsapp: app ready in India to stop fake news.